The treacle pudding and custard is awesome. Worth coming here just for that. I note that the pub normally does four cask ales, and has put on a few hundred different ones over the past couple of years. This is a pub that is worth coming back to. 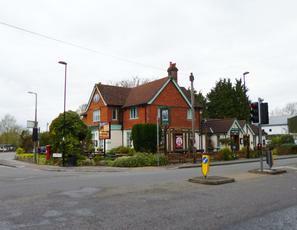 Clean and pleasant family pub near Southampton Common. Relaxed atmosphere with music softly playing in the background. Staff friendly and helpful. Does a range of cask ales - the two on our visit were Ringwood Best Bitter and 49er. Four cheap Sunday roasts plus a veggie version which is a crispy bean burger plus veg and veggie gravy. It was edible and cheap. Pub is ok. I'd be happy to visit again. It's not a special pub, but if you're in the area and the Cowsherd is full, this is ok.
"food and drinks about three times the price"
Somewhat disappointing pub which enjoys an enviable location next to the main entrance to Southampton Common. Lacks any real atmosphere or charm in my opinion. Similar decor to many Wetherspoons pubs but food and drinks about three times the price. Add to that the generally slow and often surly service and you end up with an experience you don't particularly wish to repeat. You feel it could do so much better. Fairly anonymous pub on the interior and festooned with spy cameras to survey the various and plentiful carrels and other seating nooks 'n' crannies but otherwise not demonstrably a bad pub: prompt and not unfriendly lunchtime service, reasonably priced basic food (sandwiches, jacket potatoes and main meals), some decent guest draught beers as noted by other review below eg London Pride, toilets well kept. Handy location on the junction with the eponymous Bellemoor Road and opposite Southampton Common. Main impression was that it's rather like an above-average Wetherspoons but forgot which brewery it is.